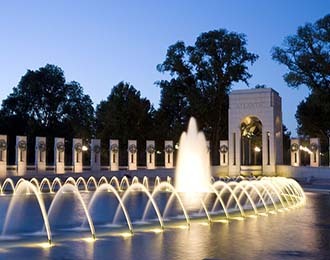 The World War Two Memorial is a major stop on our National Mall Tour. From the social destruction of the Nazis to the pushback by the Allied forces against widespread injustice, the only continent left untouched by WWII was Antarctica. A memorial could never provide the scale of the atrocities and struggles lived during WWII, but it can give us a gateway to the hard realities of a bygone era. The WWII Memorial stands monument to the spirit of the American people and their efforts in the war against global fascism. It is centrally located between the Lincoln Memorial and the Washington Monument on a central axis of the National Mall.